Feature releases tie your company, product, service, or vision to an outside trend or provide your perspective on an issue. They create a story in which your company is featured. Best of all, these feature releases are power-packed with keywords that enable your story to be found through search engine queries. Be Credible - Just because you don't have hard news doesn't mean that you should 'make up' news or sprinkle unsubstantiated claims. With feature releases, your credibility is on the line, and you do not want to overdo it with hyperbole. Research - Step outside your company walls and look at the big picture and see where you fit in. What are the compelling themes that are getting attention – the Internet of Things, sustainability, wearables, virtual reality, green computing, mobility? What are your customers doing with your products and is there a trend in the problem they are solving? What are the industry analysts saying and what topics are they tracking? With a good outside perspective, you are now ready to place your company right smack in the middle and build a good story. Keywords - Yes, keywords are hugely important as these words are the connectors for how your feature release will be found once it goes live by issuing it over a news wire service. Make a list of keywords and be sure these words are woven throughout your feature release. Also, be sure some of these words are in your headline and subhead. Purpose - Define what you are trying to achieve. Who do you want to reach and what do you want them to know about your company? Perhaps in the next quarter you will launch a new generation of products. The feature release is an ideal delivery platform that seeds your market with what is coming. 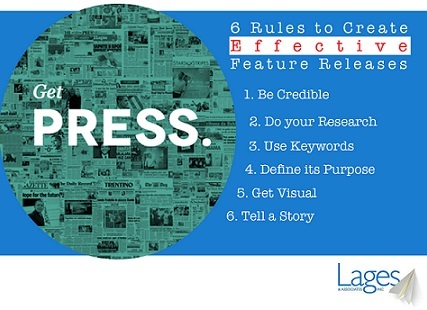 This is an ideal way to get on the radar of media who are covering the area your new products address. Or, perhaps everyone is talking about data security breaches but your software isn't categorized as security software and therefore, no one is including your company in these stories. Again, you want to connect the dots and the feature release is just the way to do so. Get Visual - All good stories have pictures, illustrations or video. This is the added bonus that helps your story stick. We all read headlines and captions and look at the pictures before we dive into the body copy. It's human nature...use it to your advantage! Tell a Story - Your feature release should frame your message as a story. Don't think in terms of pure facts, but add a human touch. Drama with heroes and villains always works – even in tech. Hackers threaten our security ... technology saves the day. Home is threatened (thief, fire, etc.) … technology notifies us. The privacy of our health records is in jeopardy ...technology protects us. Retailers tackle big box competition … technology levels the playing field. Feature releases have many benefits and allow you to tell your story precisely the way you want it to be told. With feature releases you are self-publishing over the web. They serve to communicate your message directly to your target audiences. What about media? Do feature releases have any value for a writer? Absolutely! For media, feature releases help to demonstrate where your company fits in regard to trends, issues and viewpoints. They are a wonderful supplement to traditional support materials such as fact sheets and the like. They also put your company on record as one that can comment on a particular trend and elevate your stature to provide commentary. Don't miss out on a fundamental and extremely powerful communications opportunity; try your hand at telling your story as a feature release and enjoy the results!